Disclaimer: If you are viewing in Internet Explorer 8 or older you may need to update your browser by Clicking here. Full Professor leading the way with clinical and basic science research of the latest advances in orthopedic surgery and injury prevention and teaching new physicians. Chief of Sports Medicine and Sports Medicine Fellowship Director: Department of Orthopedic Surgery. Board Certified in Orthopedic Surgery and Orthopedic Sports Medicine. 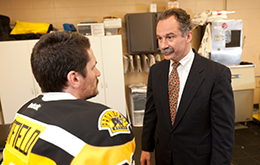 Dr. Fadale is currently the head physician for Brown University Athletics and the Providence Bruins Professional Hockey Team (AHL). We have made it easier to schedule appointments, click the button to fill out an online appointment request form through the University Orthopedics scheduling portal or call the new central scheduling line 401-457-1500 to schedule an appointment. Web site design and Copyright © Prizm Development Inc.